Spring is the time for kale sprouts – the best part of the plant. 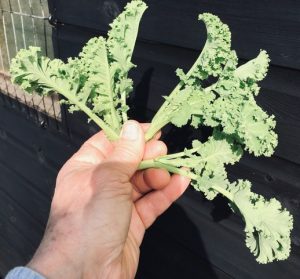 Through March and April, kale which has survived the winter starts to put out flowering shoots, a bit like sprouting broccoli. Kale sprouts are delicious – the best part of the plant. 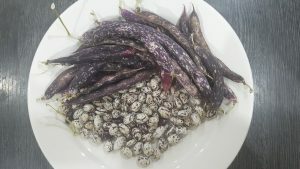 They are much better than the tough older leaves that are served in trendy cafes along with quinoa and chia as “superfoods”. I gather the sprouts when they are still growing fast, and tender enough to break off the stem easily. I wash them in a bit of fresh water, then drop them, still damp, into a pan with a bit of olive oil. Kale tastes best to me if I start it on a fairly high heat, tossing them in the oil. After a minute or two I turn the heat down and add just enough water to steam them without burning, but not so much that they become soggy. (Well, I do get this wrong sometimes, but then they are just ‘pan browned’ – definitely not ‘burned’.) When they are tender and they smell done serve them up. Cook lots, or you will wish you had. I cook broccoli the same way. Sometimes I add a clove of chopped garlic to the oil, especially with supermarket broccoli, which isn’t as tasty on its own. Our Annual General Meeting was held on 30 October at the Meanwood Institute. Our 2018 Annual General Meeting was held on 30 October at the Meanwood Institute. For the official record, read the minutes. Here is a (rather long) summary. The 2018 growing year brought us a cold, wet spring followed by a warm, dry summer, with some spectacular harvests of fruit and other crops. 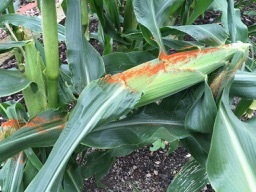 This year we discovered that chili powder is a good repellent for rats and squirrels on our sweet corn. Thanks to Ros Dunlevey for this tip. The Committee met seven times this year, discussing the usual allotment business, and also organized a number of other events. We are very grateful to Angie Willshaw, who is stepping down after four very active years as our Secretary. She has been the main driver in all of our successful projects during her time, including the new fence and gates, the communal toilet and tool shed, the senior plots, and much more, even including improvements to the public footpath along the bottom of our site. Many thanks to John Balfour, Jenny Tennant-Jackson and Sandra and John Olive, who are also stepping down after giving generously of their time and efforts. A plant bring and buy sale on 3rd June, which featured lots of beautiful vegetable seedlings and plants raised by our members, and open to all. Our autumn show on 9th September, also open to all. 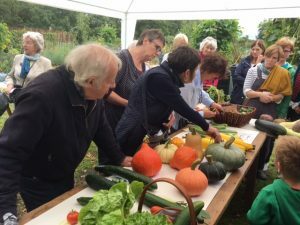 An open day on 18th August, during National Allotment Week. 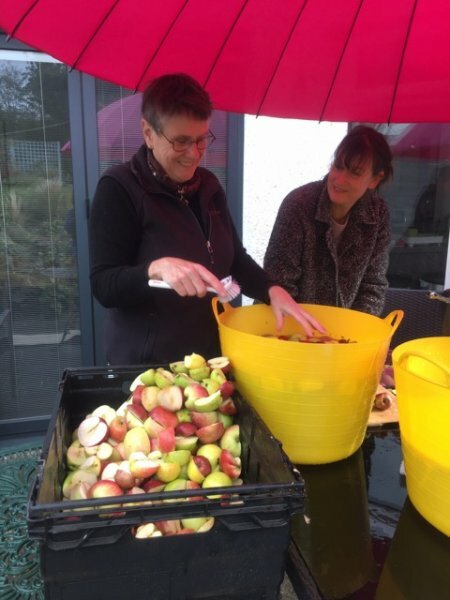 An apple juicing day on 6th October, when we hired equipment from Leeds Urban Harvest and members brought along their own apples for juicing. Several work parties which also involved members of the public and volunteers from Morgans City Living. We improved the public footpath, tidied up the site, cleared an overgrown plot, and more. Volunteers do a lot of important day by day work around the allotments: cutting grass, maintaining the hedges, looking after the composting toilet, letting out plots, collecting rents, and all the other jobs that need doing just to keep the allotments running. The Trustees do three plot inspections each year on about 1st of March, June and September, with three follow up inspections six weeks after. The committee meets each time to decide what to do about any problem plots. This year there were seven evictions. This is our least favorite job of all, but a necessary one. 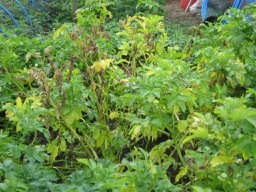 Several plot holders received warnings, and managed to improve their plots. Security was not too bad this year. There was no vandalism, but we had several instances of sheds broken into and property stolen. On the last occasion we could not see any evidence of entry around the boundary of the site, so it looks like someone had the code for the locks. This can happen if the lock is left without scrambling the numbers. Whenever this happens we have to change the code on the locks, and then tell all the members the new code. Please keep the code secret! Paths should be kept clear, and ideally at least 80cm wide to allow for safe passage of people, mowers and wheelbarrows. Ness talked us through the accounts for 2018, which showed us to be in good shape financially, with over £8K in the bank. Our takings from the plant B&B sale and show together were over £900, the best we have managed so far. She gave us a helpful explanation of how our balance seems to shift from year to year, due to the times of the accounts overlapping with rents coming in. This should be less of a problem in future. Ness has managed to find a new Treasurer for 2019, so she can step down for a well deserved break. Big thanks to her for doing this important job so ably since 2013. We added a bit to Section 5 of our constitution to create a new post of Letting Officer. 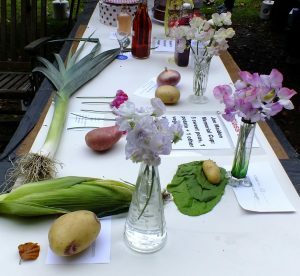 Best plots were judged by Brian Jenner of Hayley’s Field Allotments on 20 July. 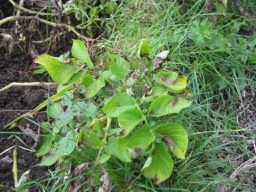 This year there were categories for full, half and quarter plots, as well as best newcomer. Malcolm Slade’s plot was the best overall, so he will hold the shield again this year. The Autumn Show, on 9 September was judged by Gillian North. Finishing the job of improving the public footpath past our allotments. Back in March 2018, we started some work on the path alongside the allotments (part of the Meanwood Valley Trail) to improve it for the local community. The work of installing our new fence (funded by the National Lottery) had left the path a bit muddy over the winter. We did a good job but we only got half way, so in October 2018, we went back to finish the job. 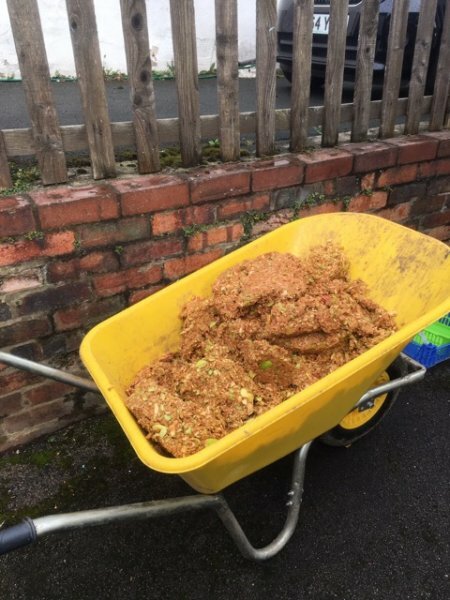 Once again, Leeds City Council provided two loads of stone, and we asked our friends at Morgans City Living to come and help. Morgans staff had done some voluntary work for us before on the allotment site, creating the lovely coppice area and making some compost bins, so we knew they were up for the challenge. We cleared the path of layers of mud to reveal the original stone base and spread the new stone on top. After a chilly start, we all warmed up quickly with our Sunday morning work-out – no trip to the gym was needed that day! We also cut back the brambles and nettles, and now hope that the wider, tidier path will now be fit for the winter weather to come. After a much needed lunch break, with fried egg butties, coffee and cake (thanks Rosie! 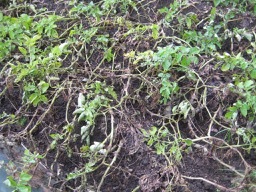 ), we resumed work, this time clearing an overgrown plot, so that it can be let to new allotmenteers. The original plot began to emerge, as we cut back trees and bushes to let the light in and wake up the baby frog having a Sunday afternoon snooze. Branches and twigs were hauled up to the back of the coppice where there is a wildlife haven. The Morgans team and the allotment volunteers enjoyed working together as a team, but I think we were all glad when time was called and we could go home to put up our feet and start thinking about doing it all again! 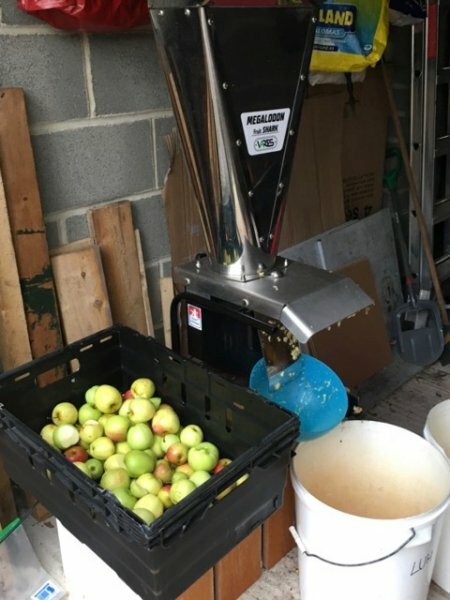 Converting our surplus apples into beautiful juice. There was a time a few of us remember when there were practically no apple trees at Hollin Lane Allotments. Recently, more of us have planted them, and now we have to figure out what to do with all our surplus apples. 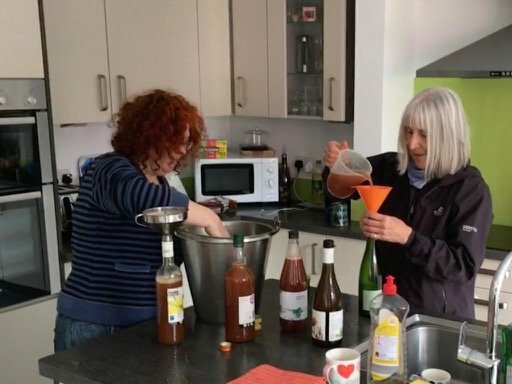 This year (2018) we tried a new approach – large scale juicing. 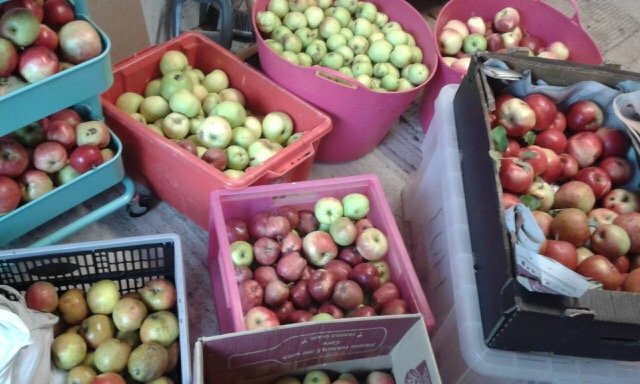 We hired equipment from Leeds Urban Harvest and spent Saturday 6th October up to our elbows in apples and juice. 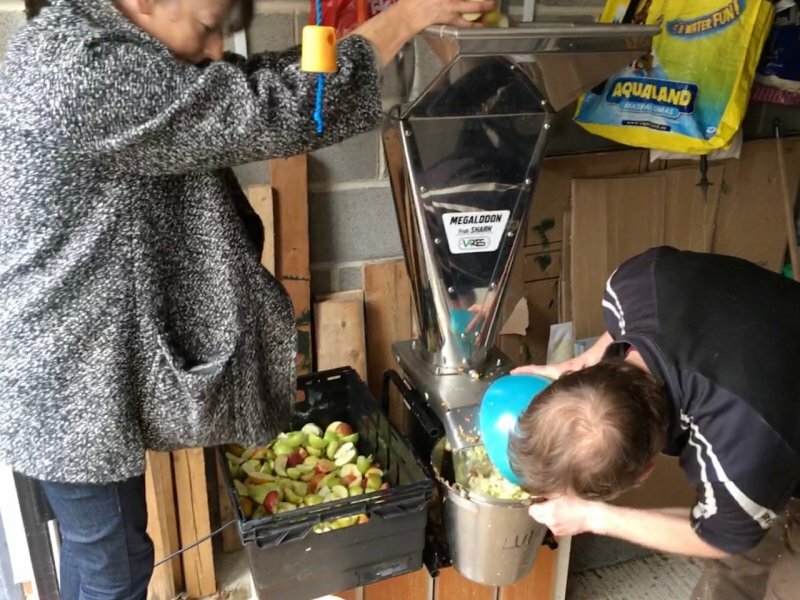 Anyone with apples could come along and make their own juice, or just donate their surplus. 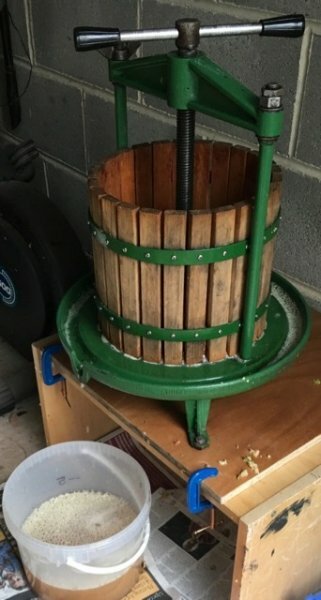 Washing the apples and cutting out any bad bits. Scratting: putting them through a fierce machine to cut them up into pulp. Pressing out the juice from the pulp using a traditional hand press. Our Autumn Show for 2018 was held on Sunday 9th September. There was a big turnout of volunteers to set up the gazebos and tables and to tidy it all away again. 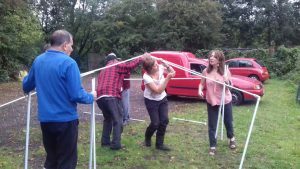 At one point one of the gazebo frames looked a bit like a confused maypole dance, but it all came together in the end. There were some really delicious refreshments (thanks to all our cooks!) and another thrilling snail race at the end of the day. Unclaimed exhibits went into the “hedge veg” box by the main gate, and quickly disappeared. Some of the winning exhibits were from newcomers – it wasn’t all just the usual old-timers. Gillian did the judging in our usual informal Hollin Lane way, explaining what she was looking for in each class and giving useful tips about growing and showing things from her own long experience as a gardener and exhibitor. Many thanks to everyone who helped make the day a success. Lots more pictures in the Gallery. I noticed that squirrels (probably – or rats?) 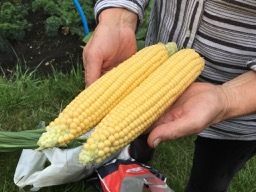 were starting to eat my ripening sweetcorn (I had actually witnessed squirrels doing this last year). 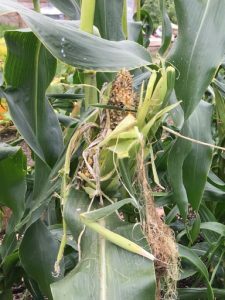 So, this time, after they had attacked the first few, I picked all the almost ready cobs – and then discovered that they were absolutely delicious and probably better than if I had left them for a bit longer. So, if the silks protruding from the cobs have turned brown they are probably ready. Then, I seasoned the remaining cobs on the plants with a sprinkle of BLACK PEPPER and CHILLI POWDER. This, especially the black pepper, seemed to last despite the rain. A week or so later, no further attacks have been made and I was able to pick another couple of gorgeous ones today. And I then re-seasoned them all. Worth a try then (unless the little so-and-sos develop a taste for curries)? 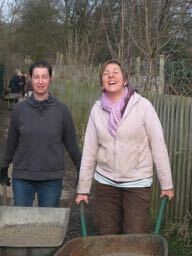 We had a successful work party to finish tidying up the edges of the public footpath on Saturday, 17 March. We managed to fill all the puddles on our bit of the Meanwood Valley trail with crushed stone which was kindly supplied by the Council’s Park and Countryside division. 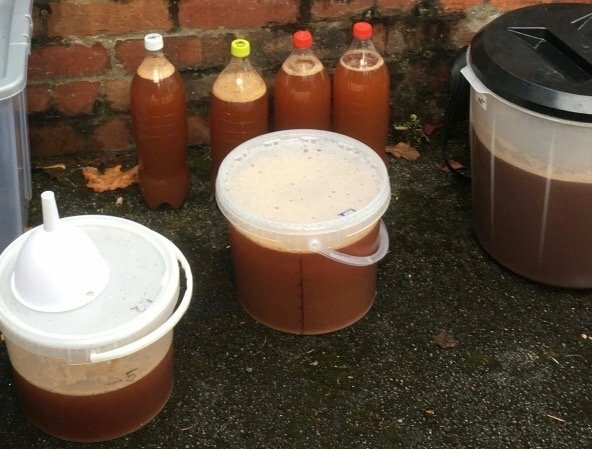 There was plenty of help, including several members of the public who had found about it. We had our usual high standard of refreshments and jolly company!